In this exhibition, we are thrilled to present a selection of new works on paper by the inimitable Neal Fox, co-founder of London art collective Le Gun. Hierarchies are reversed in a show that embodies the spirit of the Ancient Roman festival Saturnalia: slaves became rulers, sitting at banquet tables, exempt from punishment on festival days. 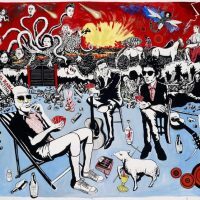 The carnivalesque atmosphere of the feast of fools, brimming with libations, gambling and debauchery, of liberation through absurdity and chaos, becomes formal and symbolic material for Fox’s psychedelic and transgressive drawings. 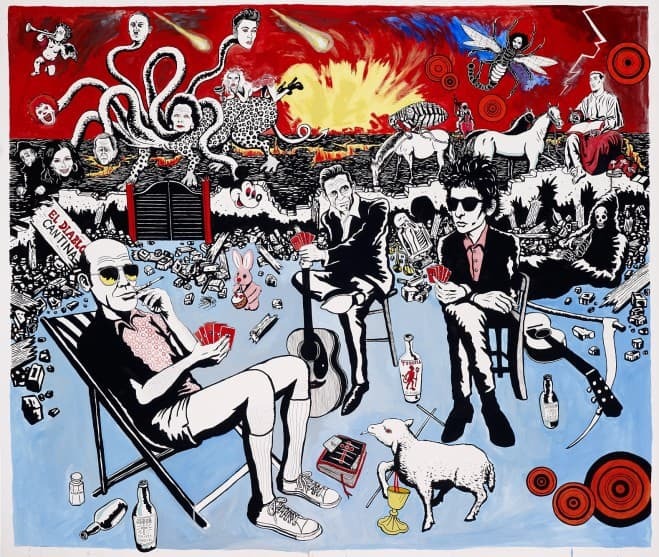 Citing a range of influences from cartoonist Robert Crumb to painter Hieronymus Bosch to novelist William S. Burroughs, anachronisms become a signifying feature of the artist’s work. Drawing upon motifs from the collective unconscious, and with a cast of pop culture figures ranging from Hunter S. Thompson to Ziggy Stardust, Fox employs his iconoclastic touch and unravels – with great humour – the grotesque in a world turned upside down.